VietNamNet Bridge - Vietcombank and VIB Bank have become the two first Vietnamese banks which have received approval from the State Bank of Vietnam (SBV) to apply Basel II standards. Both of them lead the market in service quality, governance capacity and market share. Vietcombank shares attract many investors, reflect ed in the capitalization value, P/E (price to earnings) and P/B (price to book) ratios, outperforming other banks. VIB Bank is a rising star, a leading joint stock bank in funding car purchases, and among the top 3 in bancassurance revenue and retail credit growth rate. Vietcombank and VIB were two out of five banks which first completed the purchase of bad debts they had sold to the Vietnam Asset Management Company (VAMC). The two banks, in bank governance and risk management, received support from their foreign strategic shareholders, leading banks in Australia and Japan. Besides Vietcombank and VIB, other banks have announced their roadmaps for upgrading their indexes to meet Basel II standards. They are increasing capital, improving the risk management system, information infrastructure and database. Analysts predicted that more banks would get approval from SBV in some months, sooner than initially planned. The capital adequacy ratio (CAR) of the banking system as of May 2018, as announced by SBV, was 12.14 percent. The figures were 9.39 percent for state-owned banks and 11.34 percent for joint stock banks, lower than in the end of 2017. Rong Viet Securities (VDSC), in its latest report about prospects in 2019, emphasized Vietnamese banks’ CAR, saying that this remains a bottleneck of the banking system. 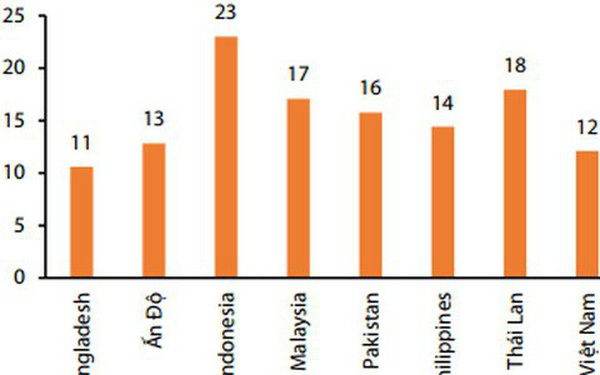 Vietnam’s CAR at around 12 is among the lowest among ASEAN countries, just above Bangladesh. At present, Vietnam’s CAR is calculated with Basel I standards, while other regional countries are done in accordance with Basel II. If Vietnam recalculates the ratio, the figure would be even lower. SBV has decided that Vietnam’s banks will begin to officially apply Basel II standards from 2020. Ten pioneering banks, including Vietcombank, BIDV (the Bank for Investment & Development of Vietnam), VietinBank, Techcombank, ACB (Asia Commercial Bank), VPBank, MB, MaritimeBank, Sacombank and VIB, would begin sooner. Banks are hurrying to increase their capital to improve their CAR. Vietcombank and BIDV have nearly completed the process. If the capital increase plans succeed, their stockholder equity would be around $1.7 billion. Meanwhile, the capital increase plan implementation at VietinBank is going slowly.